Vanessa: To celebrate the occasion of my lovely husband’s (Mr M’s) birthday, we packed up and head off on a 3.5 hour road trip out of Sydney, inland towards Orange and I will be forever grateful that we did! I’ve always heard rumors of this country town being somewhat of a foodie haven and now having experienced it, I feel the need the shout my endorsement from the rooftops to all the food and wine lovers out there. If you haven’t been, then it should definitely be on your foodie bucket list. From pubs and shops lining the main high street, to picturesque vineyards, fruit orchards in abundance and fresh, organic produce widely available, I can confidently say that it is a food lovers delight. Orange is also home to some bright shining stars of the regional restaurant scene including Lolli Redini and Racine Restaurant – both awarded one Chef’s Hat from the SMH Good Food Guide. As we packed so much into this two-night getaway, I have split the post into two parts to avoid reader fatigue! I had booked us into the Tuscan-style DeRussie Suites for two nights in a studio spa room. The hotel is centrally located just off the high street which makes it a great base to explore the town as many restaurants, cafes and bars are within walking distance. The rooms are self-contained and beautifully appointed. We were delighted to discover some elegant treats in our room by way of sparkling wine, chocolates, gingerbread and a bathroom stocked with l’occitane products. I also thought the breakfast pack, which included breads, spreads, juices and muesli was a novel way of serving breakfast to guests as it meant we could eat at our leisure and not be restricted to service times. Once settled we set out for a bit of exploration. We had been told about a place called The Agrestic Grocer which stocks a range of locally sourced products including fruit, vegetables, spreads, oils, cheeses and more. This sounded like as good a place as any to kick off our food indulgence weekend and it certainly did not disappoint. With a café on site boasting a delicious sounding menu using local produce and coffee from the Orange Roasting Co, this is certainly a place I would recommend stopping into when visiting the town. Although we did not have a meal here due to the proximity of our dinner reservation, the café looks very inviting and somewhere that I would like to try on the next visit. We wandered around the grocer amazed at the quality of the products versus the cost..and quickly readjusted to the fact that we weren’t in Kansas anymore. 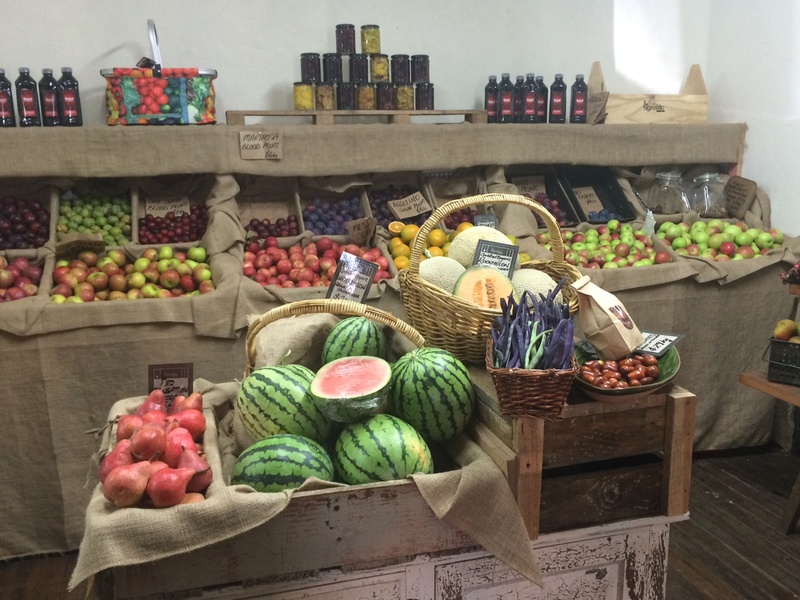 We were surrounded by organic fruit and veg as well as a plethora of items that will have any foodie thanking their lucky stars they paid this grocer a visit! We picked up some lovely items, including a bottle of wine from one of the local vineyards and some double cream brie which had been made in-house, and headed back to our room to get ready for dinner. As I had planned every moment of this weekend so as to maximise our experience, I had booked us into Lolli Redini, for dinner that evening. Situated just off the high street, Lolli Redini has been wowing patrons since its inception in 2001, backed up by receiving the accolade of an SMH Chef’s Hat for thirteen successive years. That is very impressive and with its well-thought out menu showcasing locally sourced produce, I can see why people who come to Orange view it as a must try. The restaurant has a warm and charming atmosphere created with the use of bold, red colours and soft lighting. It has the characteristics of a converted home and we were seated in the front room, which was very cosy with only one other table next to us. I was delighted to see a small bowl of marinated olives being brought our way as we perused the menu. 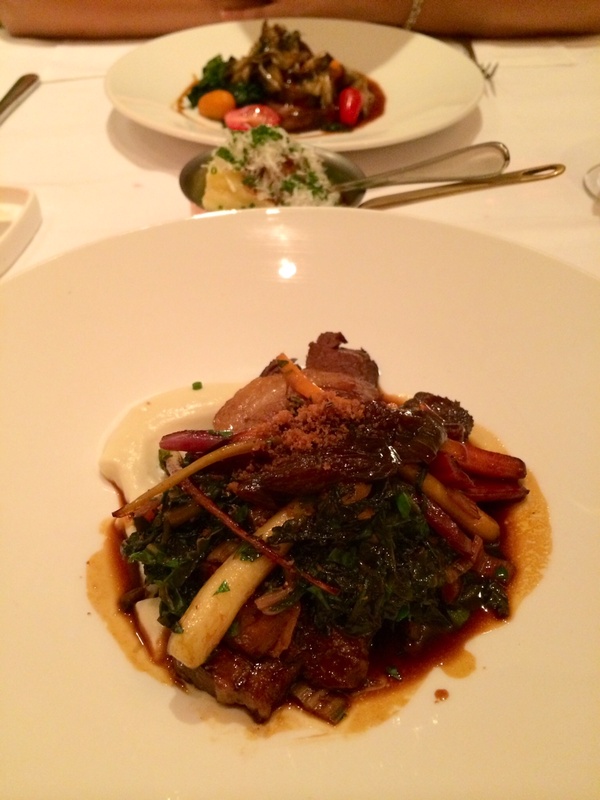 Lolli Redini offers the choice of 2 courses for $68 or 3 for $85. We opted for 2 courses in an attempt to exercise some sort of control on the first day! First up I had the citrus & beetroot cured ocean trout carpaccio which was mixed with shaved fennel, celeriac, orange and mint remoulade and a beetroot sorbet. I don’t know if my words will justify just how delicious this dish was. It really was the perfect combination of flavours that blended so well together to create such a fresh tasting dish that also had a good crunch from the fennel. I loved it and I know that Mr M had a serious case of food envy at that early point in our evening. Mr M chose the serve of six Clyde River, Claire de Lune rock oysters with champagne granita, cucumber brunoise and avruga caviar. He enjoyed them very much but couldn’t really provide too much feedback due to my over sharing on the taste sensation I was experiencing across from him! For our mains I chose the veal served up on a bed of polenta, mushrooms, wilted spinach, tomatoes and a balsamic reduction. This was another outstanding dish. The veal was served medium rare, the polenta was crispy on the outside with a soft centre and the variety of mushrooms gave the dish an edge which was quite unique. Mr M chose the braised hereford red brisket which had been slow cooked with onion, honey heirloom carrots, sautéed mushrooms, rainbow chard & pangrattato. A rich dish with strong flavours that worked well with the entrée being on the lighter side. We could not resist a side of the truffle Paris mash with fried bread crumbs, chives & parmesan. What a fantastic accompaniment to the two mains we had. The mash was creamy and bread crumbs added a wonderful texture overall. They are on to an absolute winner with this and its served as just the right portion size as well. Thankfully we did not opt for the third course as we were well and truly satisfied after that delicious meal. Of course that didn’t stop us from indulging in the petit fours that were brought to us along with my order of a machiatto and Mr M’s port. We had a truly memorable meal at Lolli Redini and I highly recommend making a reservation to dine here during your stay in Orange. It has it all from high quality food to great service in a relaxed, inviting setting so it’s not hard to see why and how they have hung on to their Chef’s Hat for so many years. We made our way out of the restaurant, passing the striking lanterns, and headed back to the suites which were literally around the corner. As you can tell, day one of our weekend escape was very food-centric and indulgent. That trend continued but did we add a few wineries into the mix just to shake things up! Stay tuned for part 2 of our Orange Weekend adventure where i’ll share with you our exploration of the local vineyards and the birthday boy’s lunch experience at Racine Restaurant. It’s been too long since I’ve been to Orange. 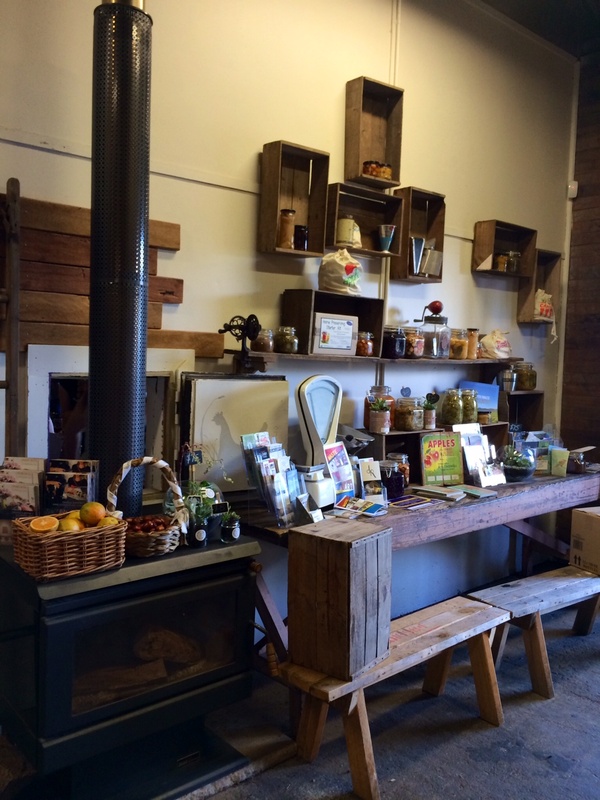 Have heard much about the Agrestic Grocer – what a lovely spot to shop! It really is a lovely spot! I definitely want to go back and eat at the cafe next time. Oh, what a fun sunny day to start off and ended with a lovely dinner. Happy birthday to the hubby! !